The latest flurry of eruptions happened over 24 hours on Saturday and Sunday, coinciding with a magnitude 1.8 earthquake. They followed a series of four other eruptions last Monday that were also triggered by two smaller earthquakes over a spate of 24 hours. New footage shows Popocatepetl erupting on Sunday showing steam and gas exploding up into the air. Footage of last Monday's eruption of El Popo, as it is known locally, showed tons of ash thrown into the sky prompting a warning from Mexico's National Center for Disaster Prevention (CENAPRED). Residents have been warned to steer clear of the volcano. "The CENAPRED urges you not to approach the volcano, specifically the crater, due to the danger of falling ballistic fragments." El Popo is believed to have erupted last week after two small volcano tectonic earthquakes were triggered, measuring 1.2 and 1.6 on the Richter scale. This weeken's followed a slightly stronger 1.8 magnitude quake, and it is feared these could be increasing, triggering more powerful eruptions. The National Centre for Disaster Prevention said steam from the latest eruption this weekend spread towards the west. 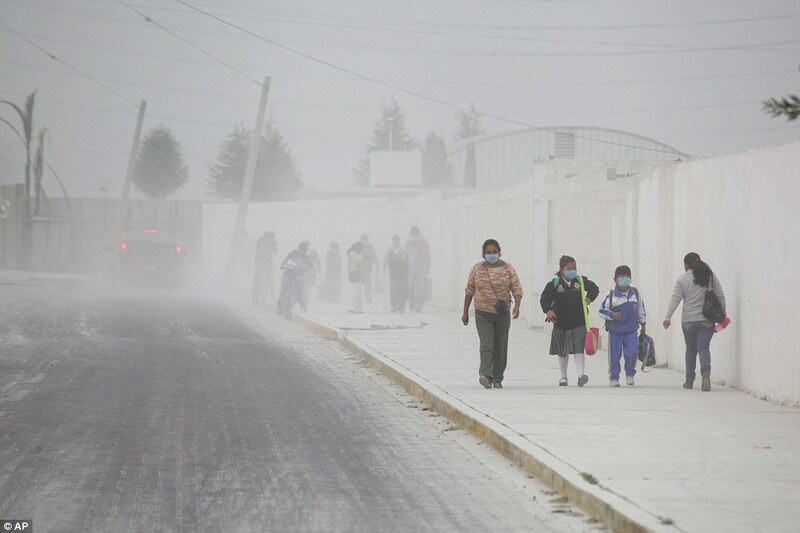 Thousands of people living by Popocatepetl have been on evacuation alert since January after the monster peak began spewing toxic gas and ash. At the time, it sent a mile-high plume of ash into the air, putting thousands of people living within 10 miles of it on a yellow alert to be ready to evacuate should activity increase. Popocatepetl, which is a 5,426-metre glacier peak, has erupted more than 20 times since 1519, according to records.